Reserve Your VIP Seating Now By Calling 319-372-3996! Mrs. Hillgartner has sold her home and is downsizing. Offered in this Online Only Auction will be modern & antique furniture, glassware & collectibles, sports memorabilia, beer signs, Precious Moments collection, tools and lawn & garden. 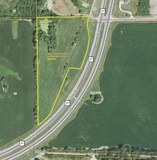 Online Only Auction of 8.26 acres selling at Absolute Auction! This acreage is ideally located between Fort Madison & Burlington, Iowa along Hwy. 61. Prime acreage for development or dream home building site. Mark your calendars for this Huge Estate Auction. The Sater family are well known in the Mt Pleasant area and were very involved in the community, serving on many boards including Old Threshers. Expect several generations of antiques & collectibles! Over 250 cataloged lots of M&M's collectibles, Shawnee pottery, Fenton & others glassware, lrg. selection of newer Fiesta dishware, many new Monopoly themed boardgames, Midwest Old Threshers cookbooks, plus many more collectibles. Large auction with over 450 lots including gold jewelry, costume jewelry, pocket watches, firearms & ammo, stainless steel appliances, modern furniture, glassware & collectibles, tools, professional 35mm cameras & accessories and household. 2-story brick home with lots of potential. Features 1,732 sq. ft. of living area including main floor laundry, 3-4 bedrooms plus a full partially finished walkout basement with living quarters. Home has current rental permit. Location 420 S. Marshall St. This auction inludes an amazing cherry 3pc. dining room set, Hummel & Lladro figurines, antique furniture, artworks & art hardback books, music CD collection, household, tools, David Winter Cottages, mobility scooter & holiday decorations. Online Only Real Estate Auction of this 3 bedroom, 1 bath home located at 1419 Avenue F, Fort Madison, IA. Features pocket doors, main floor laundry, kitchen with huge pantry cupboard and newly layed asphalt street. Exceptionally nice selection of modern furniture, like new INVACARE hospital bed & wheel chair, antique furniture, newer Craftsman snowblower, push & riding mowers, hand tools and also large Pabst Blue Ribbon sign collection from a local estate. Online Only Auction of farm toys, pedal tractors, other toys, lrg. assortment of dairy bottles, marbles, military collectibles, glassware, antiques, display cases, hand & power tools, log splitter, snow blower, Miller welder & more! Great Investment Property! Modest sized 2 bedroom home with newer roof and vinyl siding. Great starter home or investment property. This real estate positively sells to the highest bidder, regardless of price. Over 600 lots including like new mobility scooter, near new portable oxygen concentrator, plus lots of collectible glassware, early military items, Civil War era conversion rifle, paper literature & advertising, general Americana and so much more! JOIN NOW to receive our FREE email updates of upcoming Auctions & Events.